-- Life isn't always easy for Charlie Brown. Between a pesky kite-eating tree, a complete lack of valentines in the mailbox, and his troubles on the pitcher's mound it can be downright disheartening! 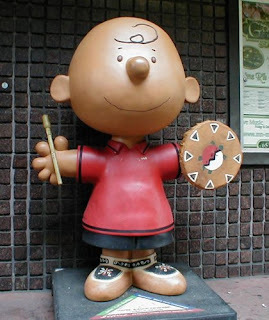 Fortunately, he has Snoopy, Linus, Peppermint Patty, and the Peanuts gang to make the big world seem a lot friendlier. Now, for the first time in book form and in full-color, It's a Big World, Charlie Brown presents a brand-new collection of your old favorites. It's just like peanuts – nobody can read just one! • Eureka Peanuts Classic Characters Deco Kit -- Peanuts Classic Characters set contains several die-cut, full-color illustrations, printed on both sides. Use to decorate windows or bulletin boards, or create a memorable mobile! Die-cut pieces range in size from 2-inches to 14-inches high. • APeanuts Charlie Brown Christmas Journey Board Game -- Journey through an icy winter wonderland with Snoopy, Lucy, Linus, Sally and the gang, and be the first to reach Charlie Brown. Gather your friends in the search for the greatest Christmas tree in all the land. - Take a minute today, to seek out custodial workers at your school, church, place of employment, etc. Give them a big Thank You for all they do to keep the place sparkling and running like a top. - We all have guardian angels. Now is the time to give them recognition and thanks for being in our lives with their own special day. Take the time today to find out how they have played a special role in our lives, in various cultures, religions and even foods. - The resolution by the General Assembly asks all members of the UN system to commemorate 2 October in an appropriate manner and disseminate the message of non-violence, including through education and public awareness. - from Jules Verne's Around the World in Eighty Days, of the famous wager upon which the book is based: I will bet twenty thousand pounds against anyone who wishes, I will make the tour of the world in eighty days or less. - take the time to learn new recipes, or indulge in fried-scallops at your favorite local seafood restaurant. Fried scallops are high in protein and vitamin B12, though the frying process does add extra fat. - Every car has character and personality. We spend a lot of time in our cars and caring for them. So, its only fitting that each car gets its own name. What will you name your car? - Dedicated to exposing, mourning, and memorializing the more than 58 billion cows, pigs, turkeys, chickens, and other land animals who needlessly suffer and die every year in the world's factory farms and slaughterhouses. - The day the world met Huckleberry Hound, Yogi Bear and Boo Boo, Mr. Jinks, Pixie, and Dixie. The Huckleberry Hound Show was the first animated series to win an Emmy Award. - American actor Spanky McFarland (born George Emmett McFarland in Fort Worth, TX) was the most popular member of the Our Gang children's comedy troupe. He got his start while still a baby, as an advertising model for a bakery in Dallas because he looked so fat and happy. - One of television's most revered series, The Twilight Zone (CBS, 1959-64) stands as the role model for TV anthologies. Its sci-fi/fantasy parables explored humanity's hopes, despairs, prides and prejudices in metaphoric ways conventional drama never could. - (October 2, 1869 – January 30, 1948) Gandi lived modestly in a self-sufficient residential community and wore the traditional Indian dhoti and shawl, woven from yarn he had spun by hand himself. He ate simple vegetarian food, experimented for a time with a fruitarian diet, and undertook long fasts as a means of both self-purification and social protest. - A smile is the best perk for the day and the easiest way to spread happiness. So send a smile to everyone you know.